Plug in to new release games, consoles & more! Nintendo Switch Neon Console. Nintendo Switch | Console Hardware. Nintendo Switch Console Contains Nintendo Switch Console. Nintendo Switch Dock. Play together - Flip the stand to share the screen, then share the fun with multiplay. Trending at AU $392.34eBay determines this price through a machine-learned model of the product's sale prices within the last 90 days. Nintendo Switch Grey Console. Nintendo Switch | Console Hardware. Nintendo Switch Console Contains Nintendo Switch Console. Nintendo Switch Dock. Play together - Flip the stand to share the screen, then share the fun with multiplay. Nintendo switch 3 games and extra controller. Games: - Super Mario Odessey - Donkey Kong Country Tropical Freeze - 1 2 Switch In good condition used only a handfull of times. Selling my Nintendo Switch and games. Included are: Nintendo Switch console Charging cable Nintendo Switch dock HDMI cable Nintendo Switch joycon controller adaptor/s Pokèball controller @play carrying case Dark souls remastered The binding of Isaac Afterbirth Little Nightmares Complete edition Undertale All less than 12 months old and rarely used. Nintendo Switch Neon Blue and Red Joy‑con With Games. This Nintendo switch has literally only been used a handful amount of times it is in new condition my daughter wanted it for her bday and has used it less then 10 times. Some of the games have not even been played with. There are 4 games: Minecraft Mario Cart Mario odyssey Just dance 2018 Pick up is from Baulkham Hills or I can deliver the item to you as well! Item is in fantastic condition been used very mini al amounts of time all in original packaging. Super Smash Brothers Ultimate. Surely a Switch cannot get better than this. Yonder The Cloud Catcher Chronicles. Literally endless hours of gaming. You'll be wanting for nothing with this console. It's only the console and include no accessories. What you see is what you get. Console is like new in the box with Monopoly played just once. Nintendo Switch Console. Nintendo Switch Dock. Nintendo Switch AC Adapter. Joy Con L Grey. NEW Nintendo 142979 Switch Console - NeonHeight (mm): 95. Choose between three different play modes: TV Mode, Tabletop Mode, or Handheld Mode. Colour: Neon. Family: Nintendo Switch. Type: Gaming Console. Trending at AU $354.43eBay determines this price through a machine-learned model of the product's sale prices within the last 90 days. NINTENDO SWITCH Console & Dock. - Joy con (L) Blue. - Joy con (R) Red. - Joy Con Grip. - Nintendo Switch Dock. Nintendo Switch | Console Hardware. It's not just Preowned. Dock your Nintendo Switch to enjoy HD gaming on your TV. Flip the stand to share the screen, then share the fun with a multiplay. Colour chosen at Random . Nintendo Switch Pokemon Let's Go! Nintendo Switch | Console Hardware. Nintendo Switch Console Contains Nintendo Switch Console. Play together - Flip the stand to share the screen, then share the fun with multiplay. Nintendo Switch Diablo III Limited Edition Console. For sale is a Nintendo Switch Diablo III Limited Edition Console Brand New never used or opened bought locally here in Perth. 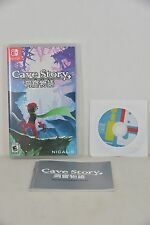 It is unsealed as this is how it came from EBay gamed. This is the Diablo III version and comes with everything that is listed on the box it has been sitting in my display cabinet never used. Also included is a preowned copy of L.A. Noire. This is being relisted due to previous sale falling through. Please view the pictures as they form part of the description and a guide to overall condition. Any questions just message me through the EBay message system. Postage includes signature on delivery and a tracking number. Diablo III Switch Carry Case. The portability of Nintendo Switch is enhanced by its bright high-definition display. Nintendo Switch Console. Ready to go?. Slide the Joy‑Con into Nintendo Switch to go portable. RARE! Nintendo Switch Pikachu And Eevee Pokemon: Let’s Go Edition! Console Only! S or ry there’s no g am e preloadedo n th e co ns ol e.
2 Joy Cons (Grey). Joy Con Grip. Great condition, works perfectly. Only missing back cover of Switch Dock. Switch Dock. Pokemon Let's Go! Pokeball Plus. When you catch a Pokémon, your Poké Ball Plus will light up and vibrate in your hand, and you’ll hear the Pokémon let out its unique cry—you’ll think there’s really a Pokémon inside! Nintendo Switch Console- Super Mario Odyssey Special Edition. 1x Nintendo Switch Console - Super Mario Odyssey Special Edition. HLP Toys & Collectibles is not responsible for the validity and running of this promotion. NINTENDO SWITCH CONSOLE HAC-001. NINTENDO SWITCH. DOCK YOUR NINTENDO SWITCH FOR HD GAMING ON YOUR TV. JOY-CON (R) NEON RED HAC-016. JOY-CON (L) NEON BLUE HAC-015. NINTENDO SWITCH DOCK HAC-007. NINTENDO SWITCH AC ADAPTER HAC-002(AUS). Bring together up to 8 Nintendo Switch systems for local face-to-face multiplayer. Platform For Display: Neon Blue / Neon Red Joy-Con. Nintendo Switch - Neon Blue and Red Joy-Con. Xenoblade Chronicles 2 Nintendo Switch Collector's Edition *NEW*＋Warranty! Warranty type :Manufacturer Warranty. Warranty Included. Warranty :Yes. 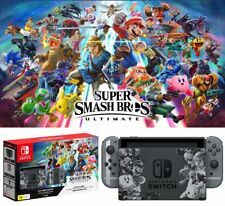 1x Nintendo Switch Super Smash Bros Ultimate Bundle. HLP Toys & Collectibles is not responsible for the validity and running of this promotion. TAKE 5% OFF THIS ITEM. 1 2 Switch As New Never Played. Zelda As New Condition. Nintendo Switch Console- Pokemon Let's Go EEVEE Edition Bundle. 1x Nintendo Switch Pokemon Let's Go EEVEE Edition Bundle. HLP Toys & Collectibles is not responsible for the validity and running of this promotion. Bayonetta 2 Special Edition Nintendo Switch *NEW*＋Warranty! Splatoon 2. 32 GB Nintendo Switch Neon Red/ Neon Blue Console - IMMACULATE CONDITION. Condition is Used. - Nintendo Switch Console. It has been barely used (7 Months Old) and is in perfect condition. The Nintendo Switch is a gaming console that is designed for maximum portability. Nintendo has always been known for its high quality consoles and legendary games. The Switch makes it possible to enjoy gaming at any moment throughout your daily routine thanks to the inbuilt screen. You can opt to purchase the Nintendo Switch Console on its own or in a bundle which may include a game and some other extra items. There are three ways that the Nintendo Switch can be used. Many people will opt to leave it connected to their big screen TV and this is perfect if you want an immersive experience or would like to play multiplayers games with your family. If you are travelling or do not have access to a TV, you can prop the Switch up using the attached stand in what is known as tabletop mode. This mode is great if you have multiple Joy-Con controllers and would like to enjoy a portable multiplayer gaming experience with your friends. Finally, you can opt to use the console in handheld mode with the controls located at either side of the screen. The great flexibility of the Nintendo Switch makes it an innovative console that is perfect for active individuals and frequent travellers that want to enjoy high quality gaming on the move. The Nintendo Switch video games library is full of great multiplayer games such as Mario Kart Deluxe, Zelda Breath of the Wild, Super Mario and many more. 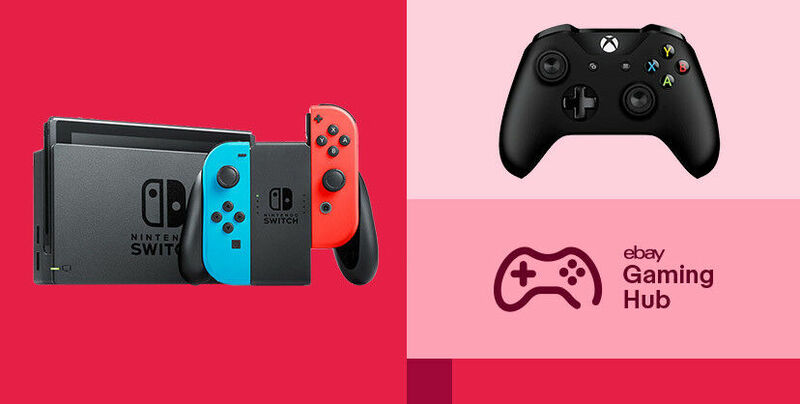 These games are best played with friends and the Nintendo Switch makes it easy to sync with up to 8 other consoles for a local multiplayer experience. This provides each player with their own screen and the maximum amount of screen real estate so it is great for children and adults that like to host gaming parties. In 2018, an online service will be launching that will enable you to play with players all around the world when connected to Wifi. Each Nintendo Switch comes equipped with a left and right Joy-Con controller. Some consoles come with grey controllers whilst others have a neon colour scheme of red and blue. These controllers are versatile, allowing a single player to use both controllers in either hand, provide a controller to a friend, or joining them to the grip to form a single controller. The Joy-Con controllers are also equipped with an accelerometer and gyroscope motion sensor, allowing you to use motion control when the game supports it. The right controller even has a built in motion camera, making the Joy-Con a highly innovative controller. If you will be travelling with your Nintendo Switch console and Joy-Con Controllers, you may wish to purchase a Nintendo Switch bag or travel case which will provide protection and keep the components neat and tidy. In portable mode you can enjoy up to 3 hours of battery life. When the battery needs to be recharged, simply use a USB-C cable which can be connected to the USB port at the back of the console. USB-C is a new technology that is featured on many devices and the benefits include high power charging and reversible design.